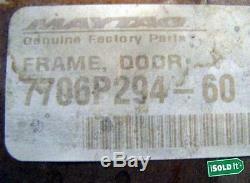 NEW GENUINE JENN AIR MAYTAG WHIRLPOOL FACTORY RANGE FRAME DR BLK PT# 7706P294-60. 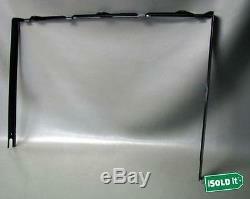 NEW GENUINE JENN AIR MAYTAG WHIRLPOOL FACTORY RANGE FRAME DR. BRAND NEW IN FACTORY SEALED BOX. GENUINE MAYTAG PARTS FIT THE FOLLOWING BRANDS. Whirlpool, Maytag, KitchenAid, Jenn-Air, Amana, Magic Chef, Admiral, Norge, Roper, and others. FITS THE FOLLOWING MODEL(S). Maytag CFE9000ACB Range - S/c D/i Ele Maytag CHE9000ACB Range - S/c S/i Ele Maytag CHE9800ACB Range - S/c S/i Ele Maytag CHG9800AAB Range - S/c S/i Gas Maytag CRE7700ADL Range - F/s Std Ele Maytag CRE7700ADW Range - F/s Std Ele Maytag CRE7700BDL Range - F/s Std Ele Maytag CRE7700BDW Range - F/s Std Ele Maytag CRE9400ACL Range - S/c F/s Ele Maytag CRE9400ACW Range - S/c F/s Ele Maytag CRE9400BCL Range - S/c F/s Ele Maytag CRE9400BCW Range - S/c F/s Ele Maytag CRE9500ACL Range - S/c F/s Ele Maytag CRE9500ACW Range - S/c F/s Ele Maytag CRE9500ADL Range - S/c F/s Ele Maytag CRE9500ADW Range - S/c F/s Ele Maytag CRE9500BCL Range - S/c F/s Ele Maytag CRE9500BCW Range - S/c F/s Ele Maytag CRE9500CDL Range - S/c F/s Ele Maytag CRE9500CDW Range - S/c F/s Ele Maytag CRE9600ACL Range - S/c F/s Ele Maytag CRE9600ACW Range - S/c F/s Ele Maytag CRE9600ADL Range - S/c F/s Ele Maytag CRE9600ADW Range - S/c F/s Ele Maytag CRG7600AAL Range - F/s Cont Clean Gas Maytag CRG7600AAW Range - F/s Cont Clean Gas Maytag CRG7700AAL Range - F/s Std Gas Maytag CRG7700AAW Range - F/s Std Gas Maytag CRG8400AAL Range - F/s Std Gas Maytag CRG8400AAW Range - F/s Std Gas Maytag CRG8600AAB Range - S/c F/s Gas Maytag CRG8600AAL Range - S/c F/s Gas Maytag CRG8600AAW Range - S/c F/s Gas Maytag CRG9700AAL Range - S/c F/s Gas Maytag CRG9700AAW Range - S/c F/s Gas Maytag CRG9700BAL Range - S/c F/s Gas Maytag CRG9700BAW Range - S/c F/s Gas Maytag CRG9800AAB Range - S/c F/s Gas Maytag CRG9800AAL Range - S/c F/s Gas Maytag CRG9800AAW Range - S/c F/s Gas Maytag CRG9800BAB Range - S/c F/s Gas Maytag CRG9800BAL Range - S/c F/s Gas Maytag CRG9800BAW Range - S/c F/s Gas Jenn-Air FCE2010B Range - S/c F/s Ele Jenn-Air FCE2011B Range - S/c F/s Ele Jenn-Air FCE2012B Range - S/c F/s Ele Jenn-Air FCE4040B Range - S/c F/s Ele Jenn-Air FCE4041B Range - S/c F/s Ele Jenn-Air FCE4042B Range - S/c F/s Ele Jenn-Air FCG2040B Range - S/c F/s Gas Jenn-Air FCG2041B Range - S/c F/s Gas Jenn-Air FCG2042B Range - S/c F/s Gas. Additional quantities of many of these items are often available, please contact iSOLD It for more information. This inventory is brand new in box and has never been used. Our store professionals use first-quality materials to pack items with care. Larger & heavier items requiring additional packaging or oversized boxes may take additional time. There will be no exceptions. This is not something we control. You may also call our store or stop by during regular store hours. ISold It ks0208: 430 SE Engle, Building 180 PO Box 19004 Topeka, KS 66619 Telephone: 785 232 3229. How does iSold It help sellers? Design a listing with descriptive and enticing copy points 4. Select a merchandising and sale strategy for your item(s) 5. Handle any and all follow-up sale inquiries or issues. Due to the high volume of items we receive each day, we cannot take additional photos of specific items. Design a listing with descriptive and enticing copy points. Determine the optimal merchandising and pricing strategy. Handle follow-up sale inquiries or issues. The item "NEW GENUINE JENN AIR MAYTAG WHIRLPOOL FACTORY RANGE FRAME DR BLK PT# 7706P294-60" is in sale since Tuesday, June 13, 2017. This item is in the category "Home & Garden\Major Appliances\Ranges & Cooking Appliances\Parts & Accessories".